One of my favorite Facebook groups is Scrap Quilt Challenge, run by Shannon, whose day job is running a quilt shop – Fabrics N Quilts in Jamestown, Tennessee. The 5th annual Scrap Quilt Challenge is underway, and Shannon has asked several of her designer friends to help provide inspiration to the challenged by posting a scrap quilt pattern on our blogs. No problem. 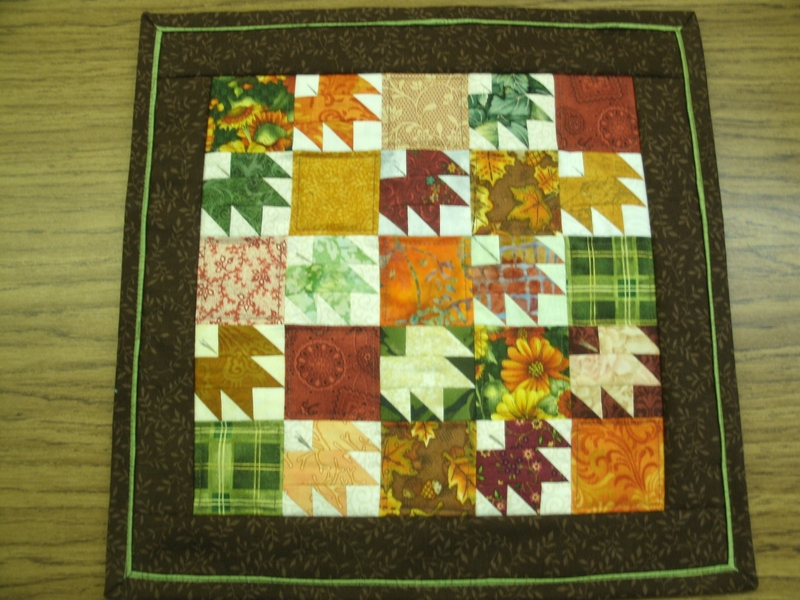 After all, scrap quilt patterns are what I do! If this is your first visit to “Seams Like a Plan”, I hope you’ll take a few minutes to look back over my previous posts. My first post explains the basics of my Thrifty Quilter scrap management system and how I came to write my book, The Thrifty Quilter:Make (Nearly) Free Quilts from Leftover Fabric . Another post from this January goes into a little more detail. In between, you’ll find a few block and project patterns and tutorials. Now, on to the Scrap Challenge block you were promised. 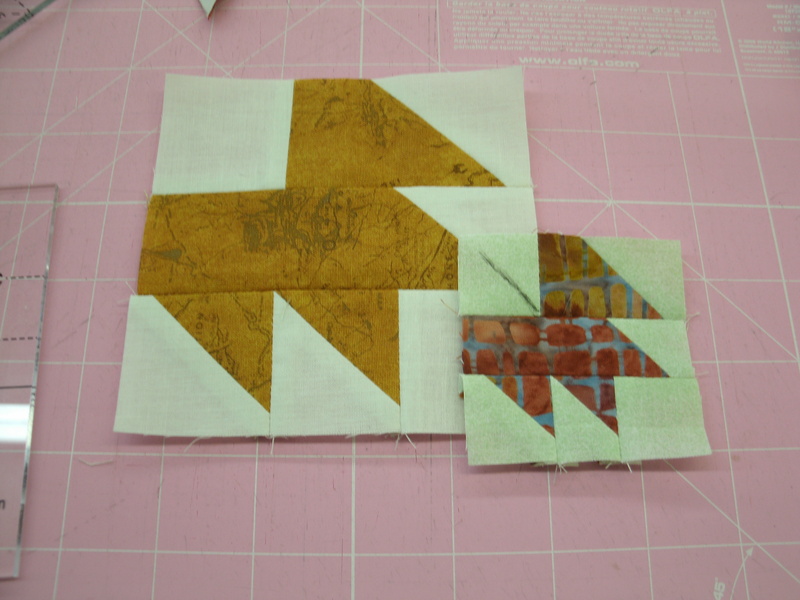 I called these blocks “Showcase” because they’re perfect for showing off print scraps that you don’t really want to chop up into smaller pieces. Step 1a: Draw a diagonal line on the wrong side of each of the dark and medium squares. 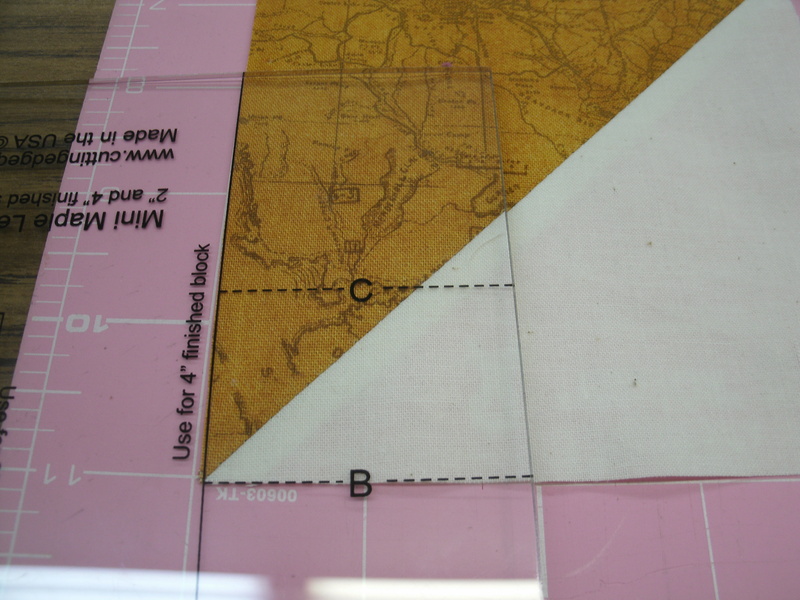 Step 1b – Lay a medium square on each corner of your 8.5″ main print square. 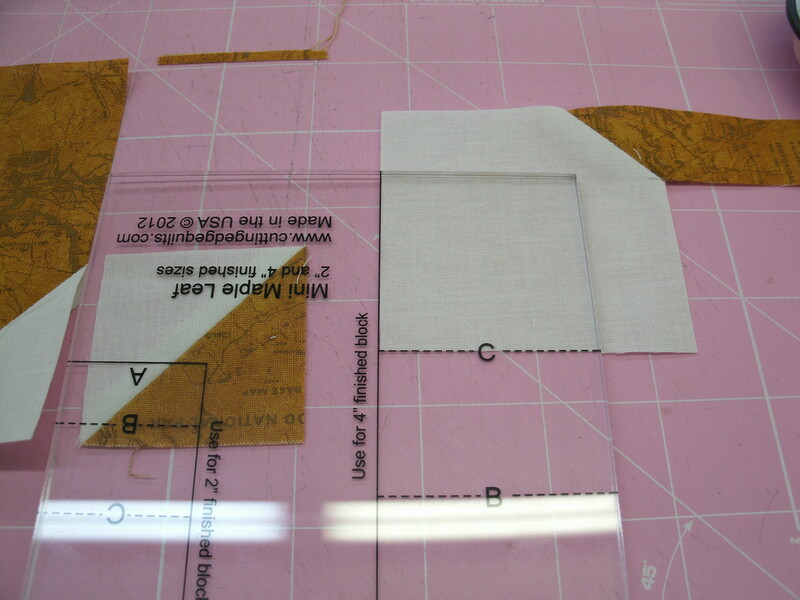 Sew on the drawn lines and trim 1/4″ outside the seam line. Press the corners open. Set this unit aside. Step 3 – Sew one flying geese pair to the left side of your center unit, and another flying geese pair to the right side. 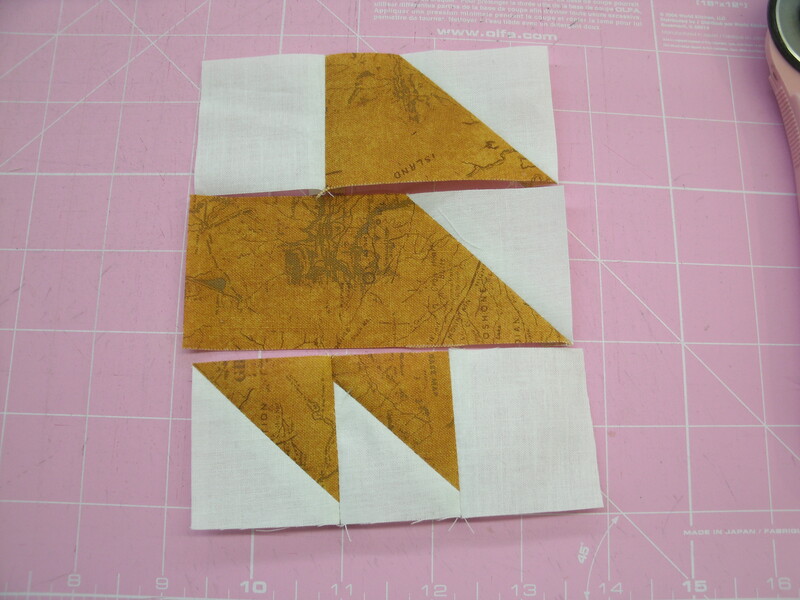 Step 4 – Sew 2.5″ light squares to the ends of the two remaining flying geese pairs. Sew one strip to the top of your center unit and the other to the bottom, to complete your Showcase A block. My plan is to use a “solid” setting with no sashing between the blocks, and alternate Showcase A and Showcase B blocks. 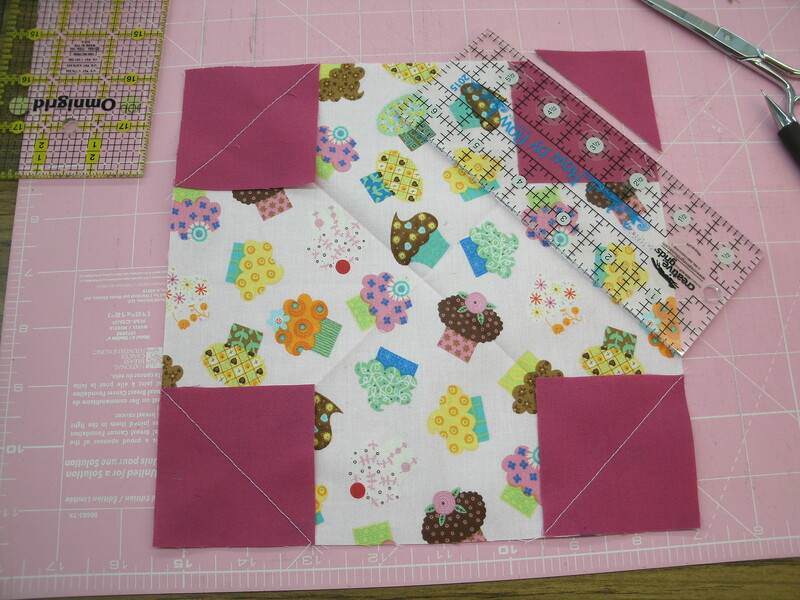 Twelve blocks (six of each) with a 4″ border would make a 44″ x 56″ crib-size quilt. 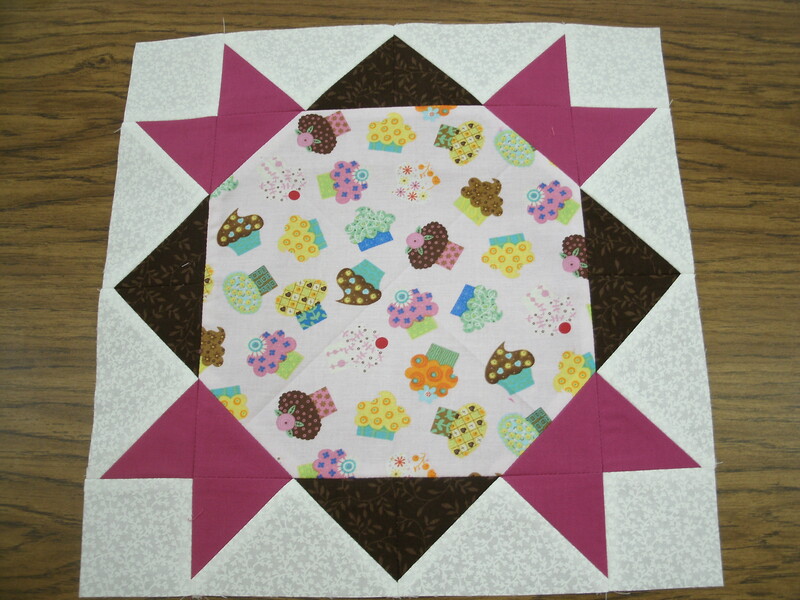 For a lap-size quilt, I would need twenty blocks (ten of each). Thirty-five blocks (17 of one, 18 of the other) would make a generous twin-size quilt, and you would need 56 (28 each) for a queen-size quilt. 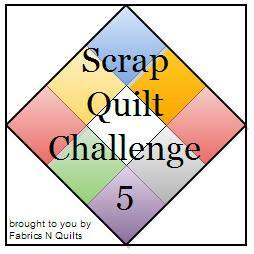 Ready to accept the Scrap Quilt Challenge? 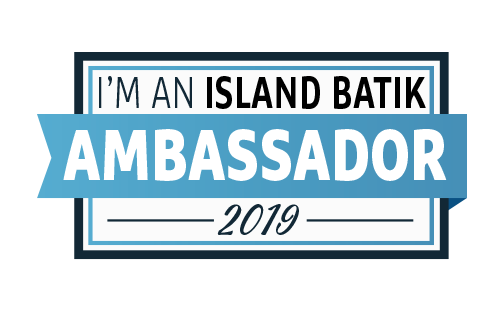 Click on the icon below for details. September is Ovarian Cancer Awareness Month. 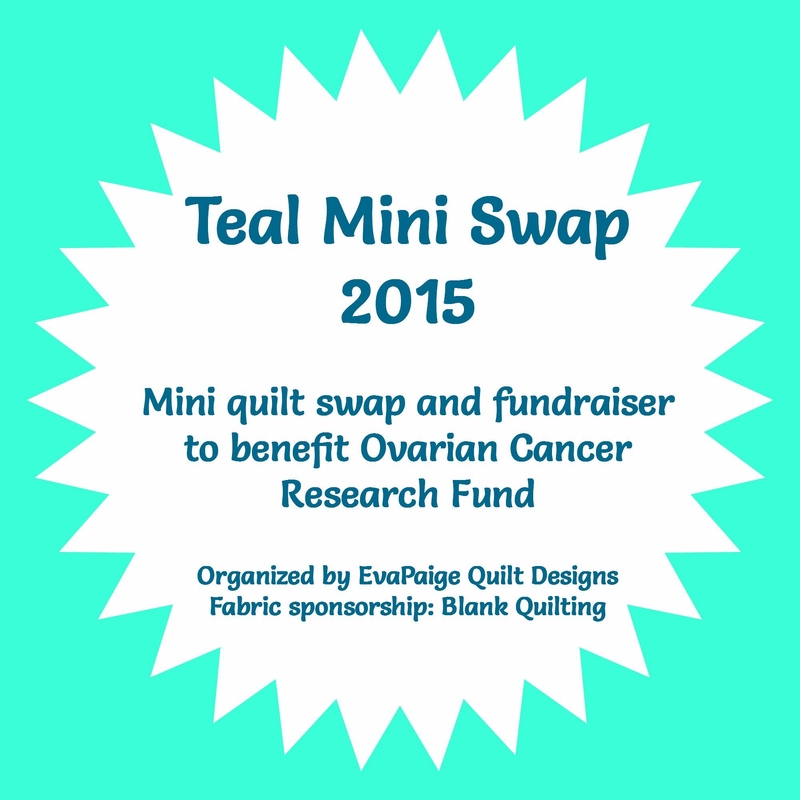 Each September my friend Beth Helfter of EvaPaige Quilt Designs hosts a swap based on a pretty teal fabric to raise money to fund research to find a cure for this ugly disease. Blank Quilting, which produces a line of teal prints each year for Ovarian Cancer awareness, has generously donated a bolt of a beautiful teal print to the swap. Each participant will receive a piece of this print, which must be used to make a mug rug or mini quilt to swap with another member of the group. Click HERE for more details on the Teal Mini Swap. You’re probably wondering what the photo at the top of the page has to do with this topic. True, there is no teal in it, but it is a miniature quilt, and gives me a chance to show off a neat little tool I picked up at Quilt Market in Portland, Oregon a couple of years ago. It’s called the Mini Maple Leaf template, and was designed by Patricia Nowak of Cutting Edge Quilts. 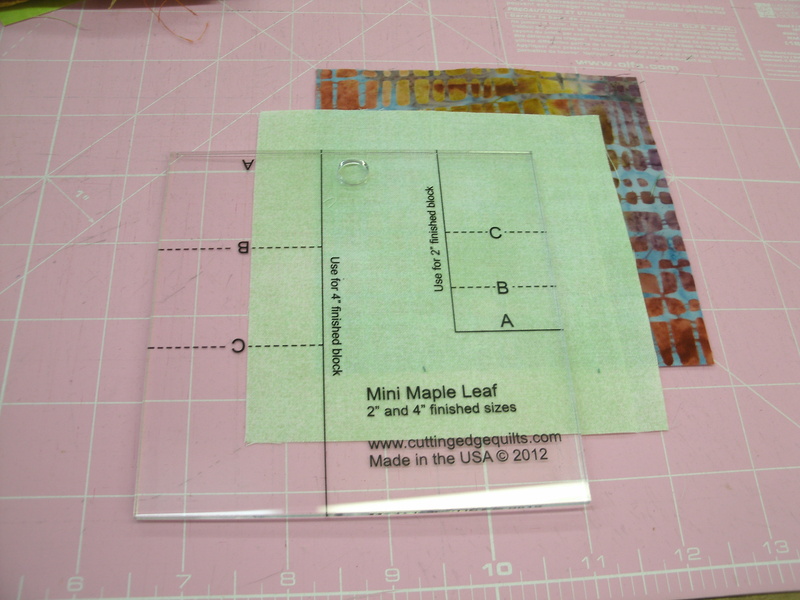 This tool is designed to make 2″ or 4″ (finished size) Maple Leaf quilt blocks. To make one block, you need one dark square and one light square. 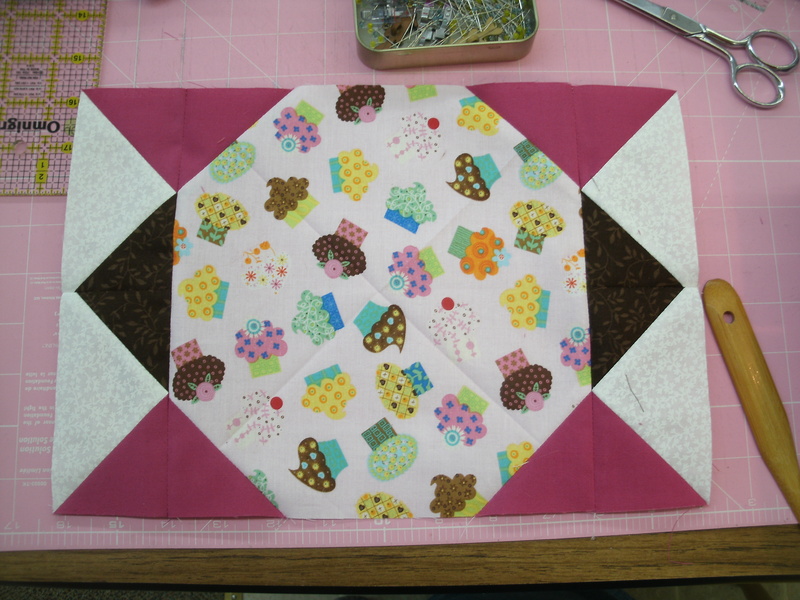 For a 4″ finished block, start with 5″ squares. 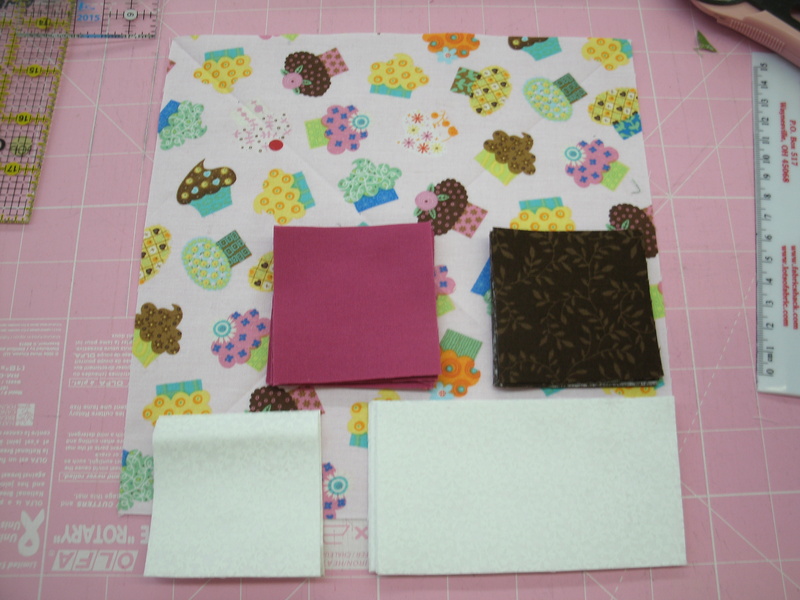 For a 2″ block, start with 4″ squares. Step 1 – Place the two squares right-sides-together and draw a diagonal line. 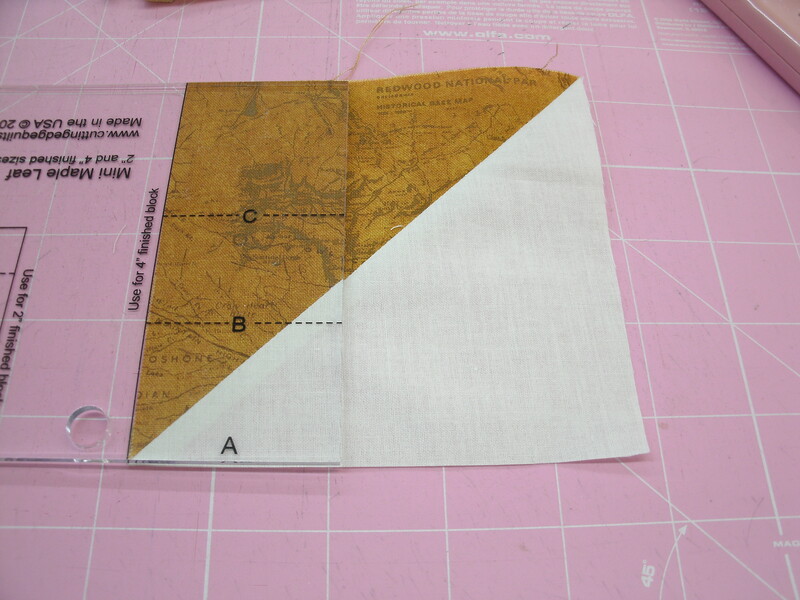 Sew a 1/4″ seam on both sides of the line. 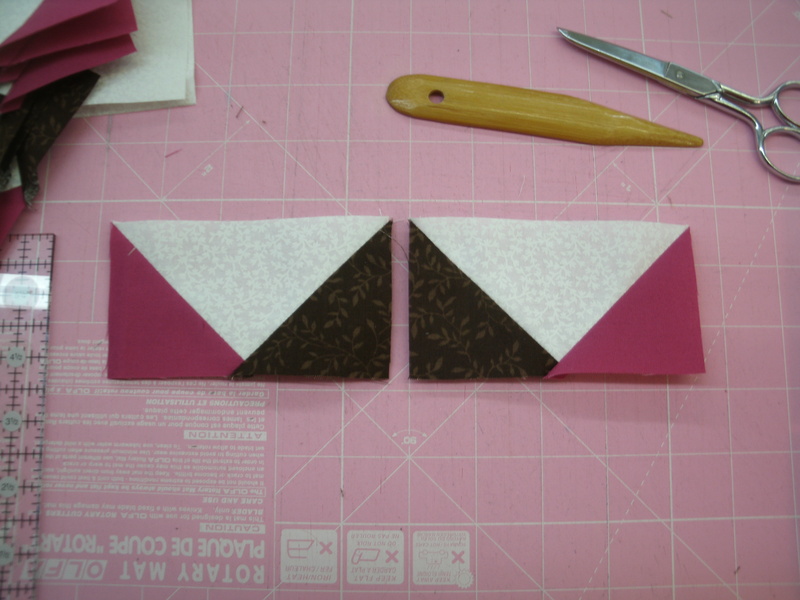 Cut on the drawn line and press open for two half-square triangles (HSTs). 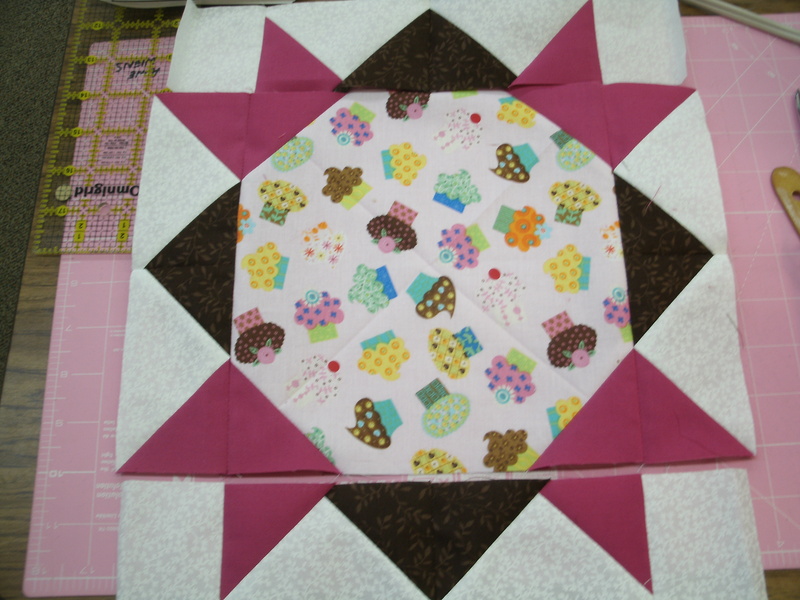 Trim to 4-1/2″ squares. Step 2a – Note: There are two sets of markings on the tool. For demonstration purposes, I’m using the markings for the 4″ finished block in these photos. 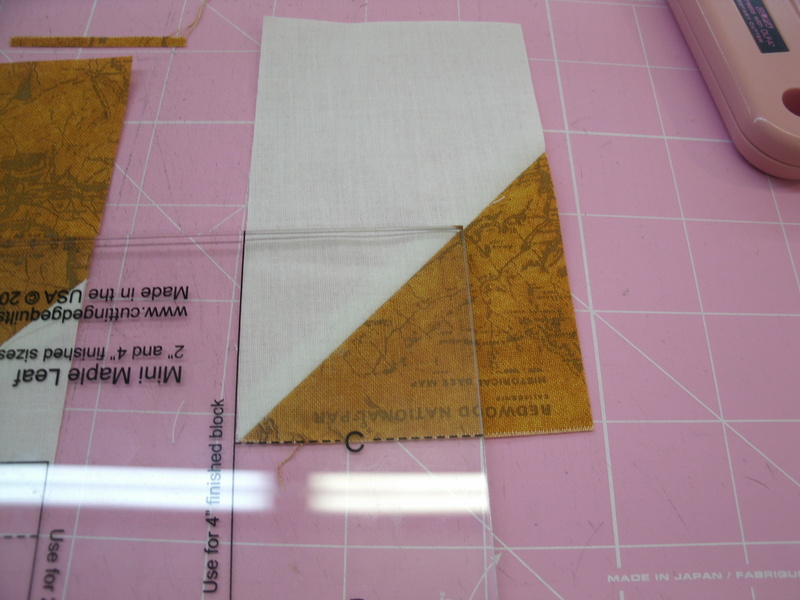 Lay one HST on your cutting mat as shown. Lay the tool on your HST as shown, aligning the full-length black line with the left side of the HST, and cut this strip from the HST. Set aside. Step 2b – Rotate the remaining piece as shown and align the tool with the solid line on the left edge and the dotted line “C” on the bottom edge. Cut this square from the piece and set aside. 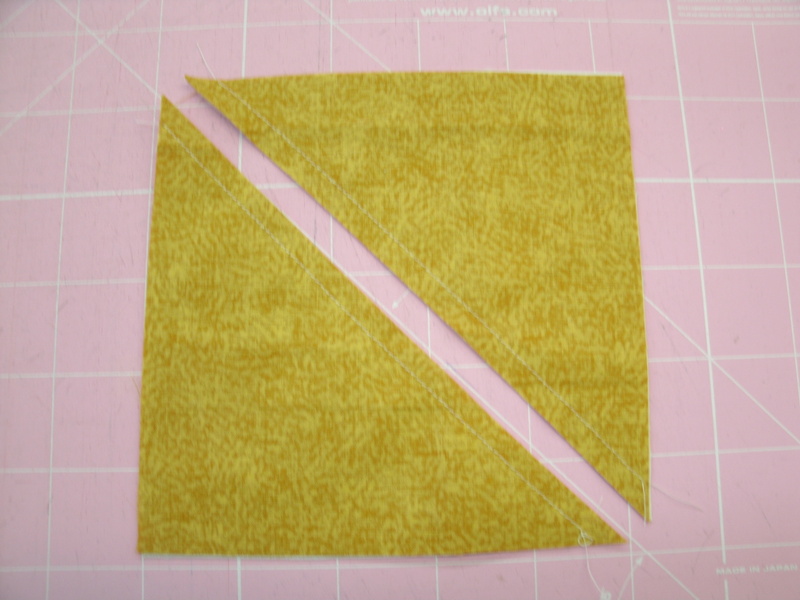 Step 2c – Cut a “C” square from the remaining white scrap. Set aside. Step 3a – Lay the second HST on your mat as shown and align the tool with the solid line on the left edge of the HST and the “B” dotted line on the bottom edge. Cut the strip from the HST and set aside. Steps 3b and 3c – Repeat Steps 2b and 2c. You should have the pieces shown above. 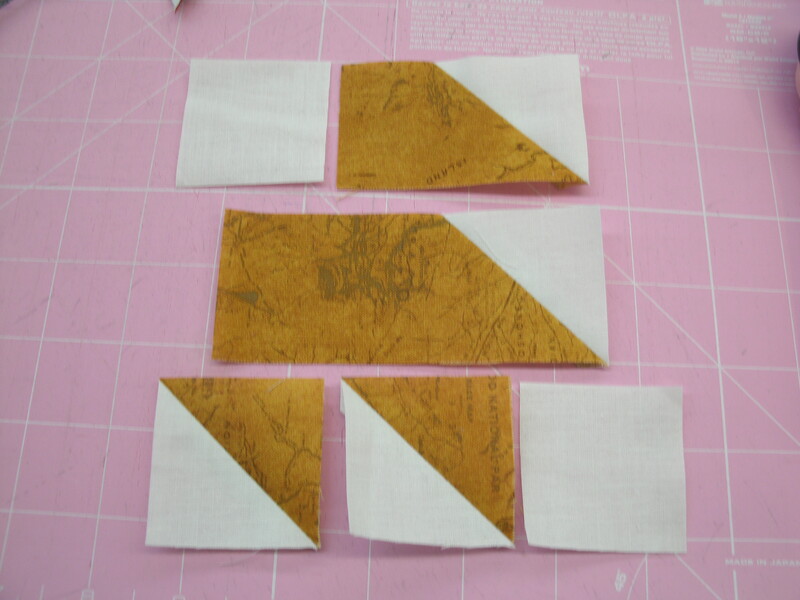 Step 4 – Sew the pieces into rows. 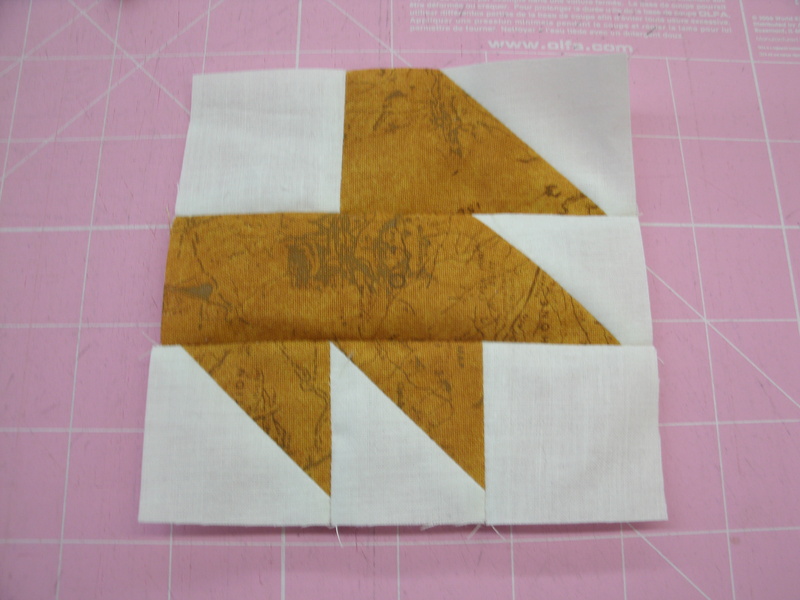 Step 5 – Sew the rows together to complete your Mini Maple Leaf block. If you start with a 4″ square (you can get by with 3-1/2″ squares) and use the other set of markings, you can make a 2″ finished block. You can embroider stems on your leaves, but I just drew them in with a Pigma® Micron pen. I used 12 2″ Mini Maple Leaf blocks (2-1/2″ unfinished) and alternated them with 13 2-1/2″ print squares for this mini quilt. The borders are cut 2″ wide, and I used a faux piped binding technique to finish it with a little flair. For more information about the Teal Mini Swap Beth is organizing, click HERE. Registration closes August 29th, and we are halfway to our goal of 200 participants, so there’s room for you and a friend or two!